and the supplementary Table 10-1 can be found in the supplementary material appended to the WGII report. The problem is that neither the discussion in the original paper, the WGII or pretty much anywhere else, does not reference baselines for each calculation or for the conglomeration of calculations. This of course is irrelevant to the question of whether IAM calculations are worth a bucket of warm spit (this being a family blog, which a few exceptions when Dad Rabett goes nuclear). The serious question is what is the baseline for each study and which sets the zero of the temperature scale? Did Poor Richard align the baseline for all the calculations. For which is the baseline pre-industrial (in which case the world is now past Tol’s outlying positive point at 1.0 C), 1860 or so when instrumental records start in which case the world is pretty close to it, or some more recent time, in which case, another couple of degrees would, at least according to Tol, have little effect. Eli notes that Chris Field Hope's model, which underlies the Stern report, appears to be making a differential calculation, which, also raises some interesting Couéen questions by itself. Or, on the other hand, is there some agreed zero that you need to have the secret handshake to know about. Eli has an honest question here. Maybe. Also, no error bars, which is ludicrous. The estimates are way too low. Total economic collapse (coming somewhere in 2022-2034) will cost us almost 100% of the economy. With a sufficiently high discount rate, the loss of the entire global economy a few decades hence is not worth spending today's money on avoiding now. To me, this suggests flaws in the economic models.. but this is economics and the world should be changed to match the models, apparently. "Final"? As in, do as I say, not as I do? NBL. Honest answers to these questions might put one's standing and salary in jeopardy, so acting high and mighty is the only possibility. One thing about Trump, he makes everybody else look good. The ultimate guy with a headpiece incapable of acknowledging real error. A Democrat less ornery than Cactus Jack would have declared that the Vice Presidency is not worth a bucket of warm gore. Don't you mean Chris Hope's model? The obvious 'baseline is to use the same date to measure changes FROM that date. While the data, title, and chart type have changed - the 'relative to today' part probably hasn't. Eli, I have no idea what Tol is claiming - and frankly none of it makes much sense to me. If someone seriously believes a 5.5C rise in temperatures would result in a mere 6% reduction on globabl GDP they must also believe in Santa Clause. More important, in these types of scenarios economics is devoid of morality - which fits Tol to a T considering his recent tweets. The man lacks integrity and I put him maybe a half-step above Moncton and Morano. All of them have some climbing to do to even reach the gutter. 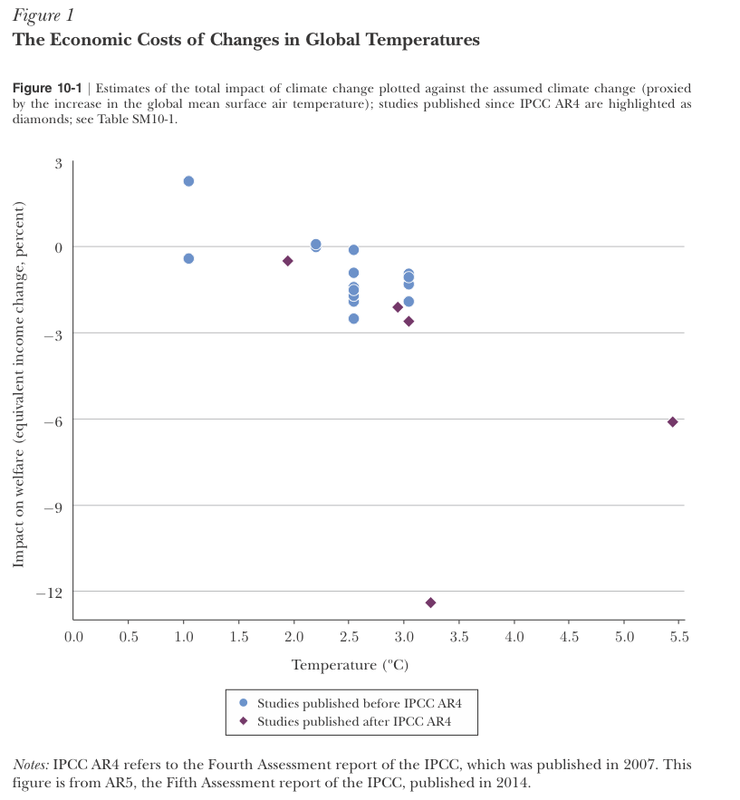 estimates of the global economic impact of climate change, expressed as the welfare-equivalent income gain or loss, as a function of the increase in the annual global mean surface air temperature relative to preindustrial times. But it turns out that caption is wrong too. As it turns out, Tol didn't actually use any real baseline. All the papers used different temperature baselines, and Tol didn't put them on a common one! And as for his claims in his papers which said they were on particular baselines... well, um... those were... uh... not true. If you'd like some details, there was some discussion of this topic at my site over a few topics. I think it was mostly on this and <a href="http://www.hi-izuru.org/wp_blog/2014/08/missing-the-obvious/</a> post. Put simply though, the work is complete and utter dreck. It's not just the temperature baselines that are different. The rate of warming would affect how bad it is. That's different too. How much countries develop would affect how well they could adapt. That's different. How much populations would grow, and where, would affect how many people were in at-risk areas. That's different. And the list just keeps on going. All of this raises the question of how did the AR5 came to rely so heavily on Tol's work in the first place? Perhaps it's as he himself said of the process; that Tol's papers were such a prominent part of the Impacts WG because "it favors initial scientific papers published on an issue, rather than the follow-up papers[.]" Of course he meant to imply that it went after the most sensationalist, alarmist papers that would later have to be walked back by subsequent work tempering the results. Well, that's another thing he's been quite wrong about (as anybody keeping track of the IPCC reports over time would have been able to tell him). Sou provides the link to the latest from Hansen, Sato & Co. Is James Hansen *the* prince of deep magic and heavy wizardry on virtually anything climate related? Jesus, by comparison Tol is just a script kiddie or cargo cult programmer playing around with spreadsheets. David Archer's referee comment almost seems fawning at times. His complaint mainly seems to be that this should have been two or three papers instead of one. The Economist, remember has been very relaxed about global warming in the past. When they are raising alarm bells, it tells you something. I don't think I would use anything more flexible than a linear model for this dataset, and even then I would look at the predictive error bars and leverage etc. as it looks like there is at least one outlier.